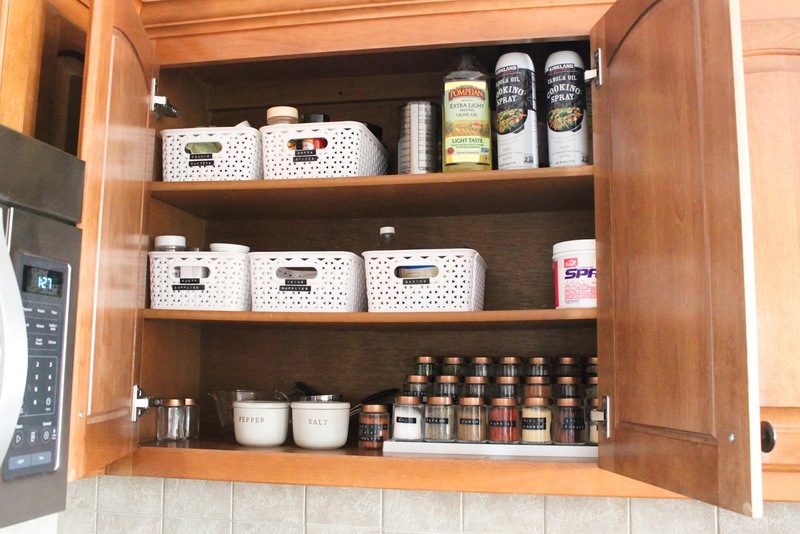 Kitchen Organization. The Spice Cabinet. "A place for everything and everything in its place." I would love for this famous quote to be true for my home. I've set out on a mission, to organize my home in 2019. For every thing that is loved, important, or useful to have a place; and when you go to that place the item is actually there. Novel idea, I know! I'm sure you are thinking, "Kate, that's crazy. You have five kids! 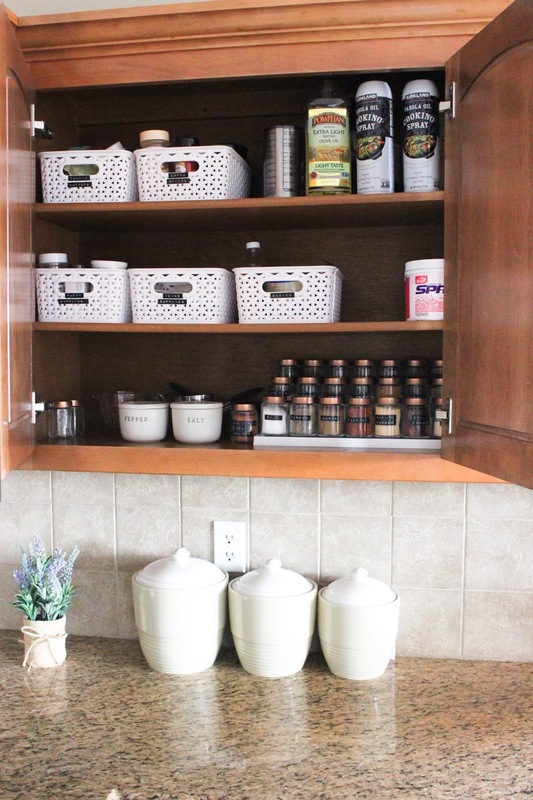 How will you ever have an organized home?" I didn't say this was going to be an easy mission. But, one I've chosen to tackle and I'm brining those five boys along for the ride. I started back in January, and I'm prepared that this mission is going to take some time. I'm breaking the process into small pieces making them easier to tackle. I've found the reward of small, complete, and organized spaces brings instant gratification and a desire to keep going. I'm talking as small as one drawer or cabinet at a time. Nothing overwhelming, but the job is getting done. 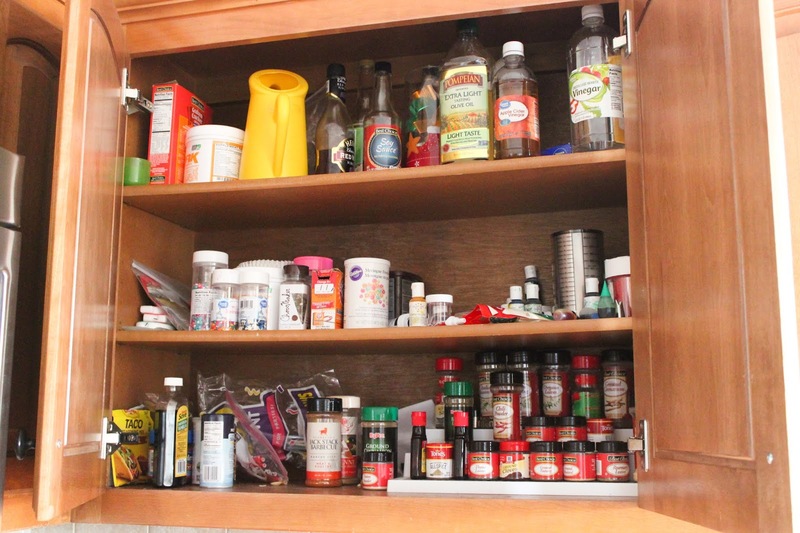 When I got to the spice cabinet, I didn't realize how out of control it had become until I finished this space. The difference is astounding. Looking at the before picture stresses me out. The after picture makes me feel calm! Who knew a cabinet could make you feel these things?!? 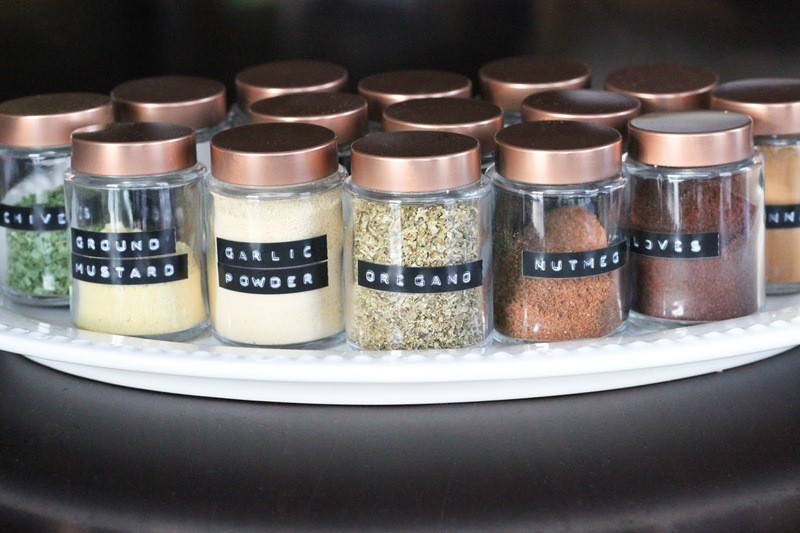 I started by ordering these spice jars when they were on sale at Target.com. I also purchased a Dymo label maker (punch version) that was only $9.99. I know I'll get more use out of it as my home organization project continues. And side note, my kids were jumping at the chance to help me so they could use it! Amazon also has a lot of great spice jar options as well. Many sets even came with spice labels. 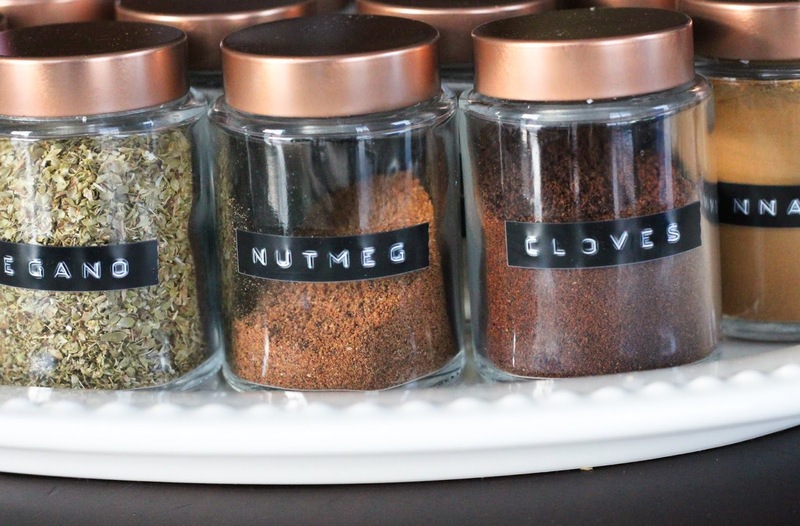 I love the copper lids of these Target spice jars and after much research, I decided that this was the look I was going for! I washed the jars in the dishwasher before transferring all my spices. I went through all my spices and was amazed at how many were expired. I honestly, never thought about spices having expiration dates! Thankfully, most of the expired spices I never use (one expired in 2007! The year my first son was born. He's eleven. Yikes)! I threw all of those away and got to work. I don't have a funnel, and I looked into purchasing one, but I was surprised that many funnels come in sets of 3. I just don't need that many, I don't want to store that many, and due to the price thought that I could figure something out since it's not a gadget I will use very often. I took a small piece of paper, twisted it, and it worked perfectly and I didn't have to spend any money on it! 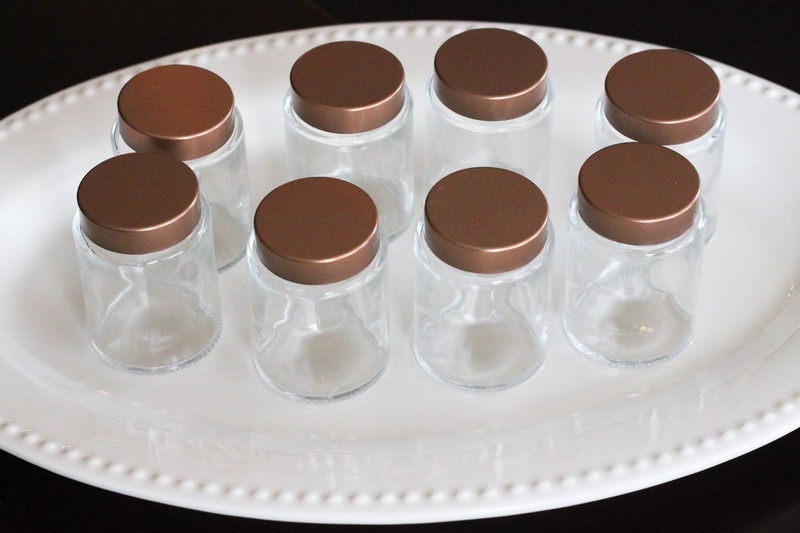 My kids were home from school, due to the weather, and they enjoyed helping me with the labeling and putting the lids on the jars (these jars also come with the plastic cover with holes for shaking). At one point I told the boys we may need to give the jars a little more dry time before we proceeded and they said, "No! This is so much fun!" My 3rd grade son loved using the label maker. It brought me great joy that he was having so much fun, and he was working on spelling at the same time! These white baskets are from Target! I love that all I have to do is grab the baking basket and all the essentials are in one place (vanilla, baking powder, baking soda, etc). It's all nicely contained and I'm not looking all over the shelf for the vanilla, it's in it's place. That's really the goal I've made for myself for this organizational journey. Creating a happy home where everything has a place. I've lived with this cabinet complete for several days now. Cooking is more fun and efficient. The newness still hasn't warn off, and I may or may not open the cabinet every time I walk by to get a peek. I can't wait to tackle my next space. Food pantry, I'm coming for you! What's you favorite organized space in your home? Monday, I flipped my calendar to October! Was anyone else as excited as I was? I love fall, and I know that technically fall officially began in September, but there is just something about October 1st that screams, "It's Officially Fall!" Pumpkin patches, hayrides, bonfires, pumpkin/apple cider donuts, changing leaves, mums, cooler temperatures; I could go on and on about all the things I love about fall. 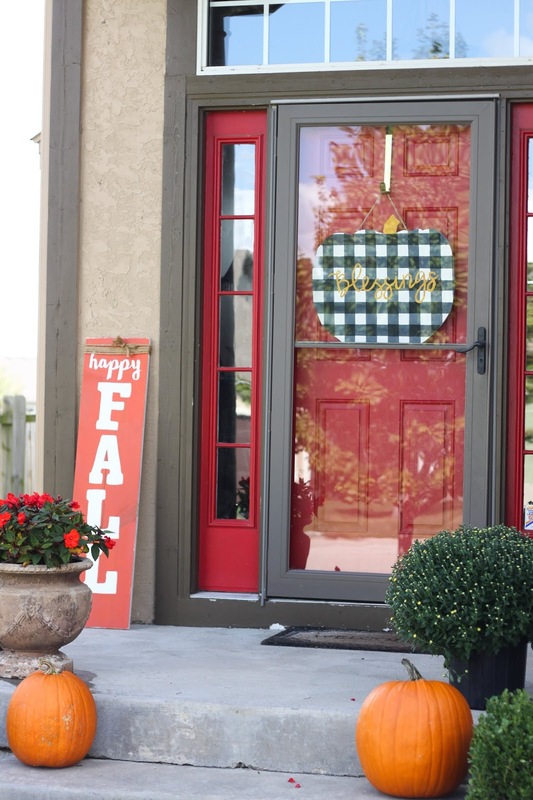 I was excited to change my porch decor and get fall represented but I didn't have anything to hang on my door. 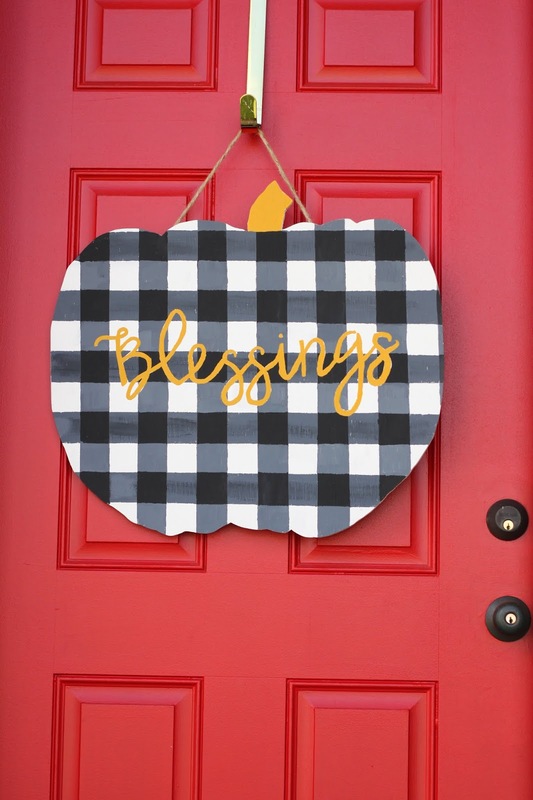 I had always wanted a painted pumpkin sign and I decided that Monday was the day I would finally get that accomplished. I loaded the boys up and headed to Lowe's and purchased a piece of 1/4" thick plywood for $5. 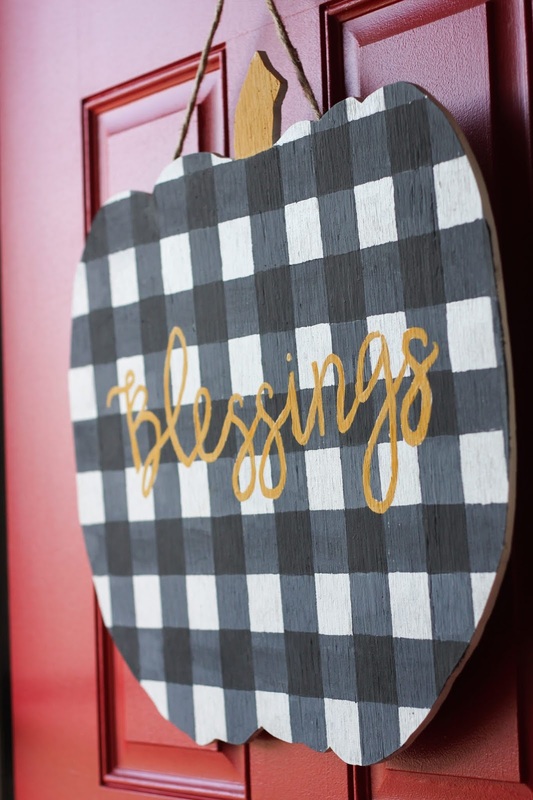 That's all I spent making this sign (and a couple hours of my time, but time crafting is such a joy to me)! I free handed a pumpkin shape with a pencil on my piece of wood. Cut the pumpkin shape out. I used a scroll saw (super easy, took about 3 minutes)! Paint the pumpkin. I gave my pumpkin two coats of white paint. I watched Junque to Jewels tutorial on buffalo plaid HERE! Katie did a great job explaining the process and it was very easy to execute! I wanted a thick buffalo plaid and I only had thin painters tape so I just doubled up and voila! After the buffalo plaid was done, I let it dry (or use a hair dryer to make sure paint is dry). I removed all tape and did any touch ups needed. After it was dry, I freehanded the word blessing on the sign. I didn't spend very much time measuring. My goal was a completed project is better than one I never finish because I take too much time trying to make it perfect. It was actually very freeing not worrying about perfection (and I actually had more fun)! I used a staple gun to attach twine to the back. Hang on your door and stand back and enjoy! I love when I pull out of my driveway and the sign catches my eye. Happy Fall! Relationships are the conduit God uses to bring change in our lives. Through the course of life, we are all bound to meet people along the way that impact us deeply. Friends that leave an indelible mark upon us forever. God has shown His grace to me by allowing one of those friends to be Sandy Badgett. I've had the privilege to know this special woman for 14 years, she has invested in me as a friend and mentor. My heart has been heavy since hearing she passed away this past Sunday. She was gifted with words, and always had the right thing to say to encourage you no matter the life situation you were facing. Now as I look back, I realize to an even greater degree the gift she gave me. It was truly remarkable the way she would draw on her vast wisdom. And that only came from walking with Jesus for many years, and through learning from the joys, trials, and sorrows of life. She was truly a woman of God. Whether she was speaking to me about being a wife, a mother, or someone in ministry; she always encouraged, and always pointed me to Jesus. My heart has been searching for peace and comfort knowing Sandy is no longer with us. After hearing of her diagnosis of brain cancer in February, I thought there must be a mistake. The results had to be wrong. Sandy has impacted so many children and women for the gospel, through many years of faithful service to the Lord and doing life with others. While out on a brisk morning run, I pleaded with the Lord to deliver her from this cancer. We still needed her here. She made such an impact on the world. She made such an impact on me. I thought surely the Lord would deliver her from this diagnosis and bring glory to His name. While I don't understand why the Lord called her home, I stand in confidence that God is sovereign and He is on His throne and reigns over all things. Nothing happens outside of His permission. His plans are greater than our plans. Understanding His sovereignty brings peace and confidence. Knowing Him allows me to rest even when I question. Yet, the Lord did deliver her from her illness, on a beautiful blue sky day in September (Sandy loved blue sky days). It wasn't in the way I was hoping, but perfectly according to His will and plan. She is in the presence of her Savior, the Lord Jesus Christ and she is more alive today than ever before. Great glory is being brought to His name through the many lives she impacted and touched, through the stories being told, and the lives she molded. Now, I pray that all the people she impacted and ministered will be compelled to pay it forward. How do we carry on her legacy? To encourage others. To have gospel conversations. To invest in another spiritually. To simply give time to another. Ultimately, to use relationships for God's glory and our good. "May we each continue to walk this earth remembering to Bring Glory, Build Relationships, and Be Thankful. All the Glory goes to God. It is not about me, it is all about Him." As I read this note, I could hear her voice. As if saying, "Kate, press on and allow this manner of living to be your theme until we meet again." As I close, I am reminded that God really does use relationships as the conduit to bring change into our lives. 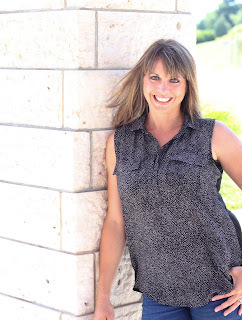 I am a better person, wife, mom, friend, and follower of Christ because of my friendship with Sandy. What relationships are you investing in? My third baby is starting Kindergarten tomorrow! Cue all the tears for this momma. My little guy is excited and ready to go, which makes it a little bit easier on me. It's so hard letting go, but a wise friend once told me years ago that the process of letting go is a gradual one that begins the moment you hand your newborn baby to anyone other than your husband to hold. There are many little moments and milestones along the way to prepare not only your child, but you, for them to leave your home someday. Tomorrow, we will hit another milestone. It's really true the days are long, but the years are short. For five years I've been nurturing my baby and he's grown, and is ready for this. He is going to rock Kindergarten, and I will be here cheering him on every step of the way! Here is a quick run down of the books we are reading to get even more excited for Kindergarten! We have several of these in our personal library from years past when Cooper and Max started Kindergarten. I also reserved some of these titles at the library to have some new books to read!